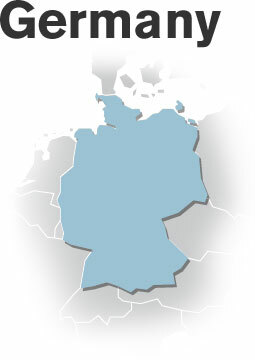 With a population of 82 million, Germany is the largest country in the European Union. It has a strong literary tradition and is Europe's strongest economy. It also has a relatively high immigrant population, with more than 7 million people, or nearly 9% of the total population, defined as coming from a non-German immigrant background. Germany scored an average of 484 points in the first PISA test for reading and literacy, below the OECD average of 500 and well below Finland, the top performer, which scored 546. In a country that had prided itself on equality, PISA showed that Germany had a higher correlation between family socio-economic status and student achievement than any other OECD country. In 2000, German students spent less time in the classroom than students in many other countries: only 796 hours per year in primary school and 903 hours in lower secondary school, against OECD averages of 841 hours and 936 hours. A rigid tracking system under which students were channeled at age 10 into one of three types of secondary school limited the opportunities for many students to improve their performance. Among inhabitants of a non-German immigrant background, the largest group is of Turkish origin: 2.5 million people, or nearly 3% of the population, followed by 1.3 million Poles. Germany has a strong system of apprenticeships that trains many school-leavers for jobs. Around 60% of all young people learn a trade within its dual system of vocational education and training. As a corollary, however, fewer than 40% of German secondary school students go on to university, compared with an average of nearly 60% in OECD countries. Galvanized by the so-called "PISA shock," political parties, unions and parent groups worked together to develop significant reforms. Though many of these have still only been partially implemented, there has already been an improvement in students' performance. This trend is expected to continue as more students benefit from the effects of the reforms. Germany's scores in reading and literacy improved to 491 in the 2003 PISA tests, 495 in 2006 and 497 in 2009. In mathematics, they advanced from 503 in 2003 to 513 in 2009; and in science from 516 in 2006 to 520 in 2009. Despite increased spending on early childhood education, these results were achieved without significant overall increases in spending on education. Germany spent 4.7% of its gross domestic product on education in 2008, down from 4.9% in 2000 and compared with an OECD average in 2008 of 5.7%. Between 2000 and 2005, the number of school students fell by 4%, while average spending per student increased by 5%. As of mid-2009, Germany had 4,283 Hauptschulen, 2,625 Realschulen, 3,070 Gymnasien and 1,363 schools offering both Hauptschule and Realschule courses. There were also 705 comprehensive high schools, known as Integrierte Gesamtschulen. When the first PISA tests in 2000 placed German students well below the average in OECD countries for reading and literacy, the nation was shocked. The revelation sparked a nationwide debate about Germany's school system and what was needed to improve it. Published in 2001, the PISA 2000 results revealed that the German system was not providing equal opportunities for all. Students from disadvantaged backgrounds were particularly at risk. Rather than basing the choice of secondary school solely on student achievement in elementary school, the system was actually denying opportunity to disadvantaged students. In discussing reform options, educators had to take account of Germany's highly decentralized education system. While the federal education ministry has an oversight role, the nation's 16 federal states have primary responsibility for schooling. Policies covering almost everything from teacher training to curricula are decided at state level. The states coordinate their policies in the framework of a standing conference of education ministers, the Kultusministerkonferenz, or KMK. The Hauptschule, offering a program designed for those deemed to have limited academic ability or interests and culminating in a school-leaving certificate. PISA 2000 showed that this system was far from producing optimal results. Even when students in primary school were equally matched in terms of actual achievement, those whose parents had attended Gymnasium were three times more likely to be sent to a Gymnasium than those whose parents had gone to a Hauptschule. The three most important predictors of low performance in the PISA 2000 tests were shown to be: a student's socio-economic background; lack of fluency in German; and coming from an immigrant family. After extensive debate, education experts concluded that the tripartite school system was one of the main reasons for Germany's weak overall performance. Reflecting the fragmented nature of Germany's education system, PISA revealed wide variations in standards and curricula across the country. Although the federal ministry's room for action was limited, it responded by working with state ministries to develop common curriculum frameworks, performance standards and tests, and to enhance the use of benchmarking. The federal government also introduced new legislation to expand the availability of pre-school for children under three and give all children from three onwards the right to a place in kindergarten until they begin elementary school. State authorities worked together to strengthen the educational content of pre-school programs. Another feature of Germany's school system that came to be perceived as a potential cause of weakness was the relatively short school day. Students started school early but left at lunchtime. This was not a problem in families where only one parent worked, but it created difficulties for single-parent families or those where both parents worked. Individual states responded to the need for reforms in different ways and at different paces. In many states, moves were made to lengthen the school day and introduce extra-curricular activities, focusing particularly on the needs of children from disadvantaged backgrounds. Extended school days are not compulsory, however, and schools that do take this option are required to remain open in the afternoon for only three days a week. Moves were also made to improve the quality of Germany's teaching force. Although teachers in Germany had high educational standards, many were approaching retirement. Reforms negotiated with teacher unions built on the existing high standards to raise skills in key areas. New teachers are now trained to diagnose and address specific problems faced by struggling students, as well as to undergo extended supervision and mentoring by master teachers before taking up full-time teaching. Thanks to the combination of reforms and a nationwide effort to raise performance, Germany's education outcomes are improving. In the PISA 2009 tests, Germany's lowest-achieving students did better than in 2000, while its highest-achieving students maintained 2000 levels and the negative impact of students' socio-economic background diminished. From 21st place in 2000, Germany rose to equal 15th place alongside Sweden, just ahead of Ireland and France but behind the U.S.